Ever wish you could give more to help animals? Today you can! Janet Jensen of Human Investment has offered to match every donation toward the ADI Wildlife Sanctuary up to $150,000. That means your donation of $10 is actually worth $20 or, every $1,000 is worth $2,000! Donate today and the ADI Wildlife Sanctuary will receive DOUBLE your donation! Donate in USD $ here. Donate in GBP £ here. If you believe in the work of ADI, please read on. We have secured over 450 acres of beautiful natural grassland in South Africa, with trees, lakes, four strong water boreholes, excellent accommodations for volunteers and workers, and space for an education center and on-site veterinary facilities. The progress made at the sanctuary over the past months has been truly incredible. 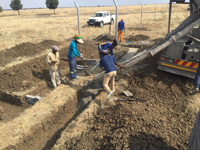 Enclosures have been built, with miles of pipeline laid to feed water into each; trees and shrubs have been planted to reclaim the land; and a high security, electrified, fortress fence, and second fence for double protection are nearing completion. With your help, we will turn this into a paradise for animals. Safe and secure, monitored but with the space where they can live as close as possible to the freedom they lost. We pride ourselves on our strategic approach. Our undercover investigations expose the hidden suffering and abuse: we compile scientific and economic evidence; we campaign creating public awareness; we secure laws to eliminate the suffering; then we help enforce those laws. We are the only organization undertaking large scale operations in different countries to enforce the bans on animals in circuses. We have emptied Bolivia and Peru of ALL circus animals, and rescued animals in many others. We are now enforcing Guatemala’s ban. The missing component has been our own sanctuary. This has meant investing millions of dollars in different sanctuaries and funding ongoing care for animals in these. The cost of land and construction in the US, UK, and Europe is too high for us to be able to build here. In Africa, we can provide more space, their natural habitat, and save more animals. Increased sanctuary capacity is desperately needed in Africa. A wildlife official said that, currently, they confiscate lions but with nowhere for them they are put up for auction – saved from one hell hole only to be at risk of being sold for the bullet. We could help them. This will be an ethical, environmentally-friendly sanctuary with high standards of animal care and promote the ideals of ADI through an education center. We searched for the right habitat for our animals. Security for captive animals is an issue in South Africa and elsewhere, and we have a plan to deal with this. Many sanctuaries and other places have failed to implement adequate security measures. We will have state of the art security with multiple perimeter fences and cameras. Can you help us create a true sanctuary, at the heart of saving animals and enforcing laws for many years to come? Join our friends, sponsors, co-founders, and founders to make our dream of a safe haven for suffering animals a REALITY! Your contribution will create a lasting legacy for animals. $500 to $999 / £375-£749 / R6,650 to R13,260 – Friend, with your name listed on our honor board in the main reception area. $1,000 to $2,499 / £750-£1,999 / R13,270 to R33,230 – Freedom Pathway Sponsor. A medium sized paver on the freedom pathway in the sanctuary and listed in the main reception area. $2,500 to $4,999 / £2,000-£3,999 / R33,240 to R66,450 – Champion. Your name on a large paver pathway and listed in the main reception area. $5,000 to $9,999 / £4,000-£7,499 / R66,500 to R131,999 – Co-founder. Your name on the list of sanctuary Co-founders at the entrance to the main reception and also on a brick lion night house. $10,000 / £7,500 / R132,800 – Founder. A contribution of $10,000 or more will be acknowledged as a sanctuary Founder. Founder names will be displayed prominently at the entrance to the main reception and also on a brick lion night house. $20,000 / £15,000 / R265,500 – Habitat Sponsors. Your name, or you and your friends, on one of our first 5-acre habitats and brick lion night houses, and displayed in the main reception area. Contact us for other sponsor and partnership opportunities. Please remember that every contribution makes a difference! Donate in Euros or make a monthly donation here.